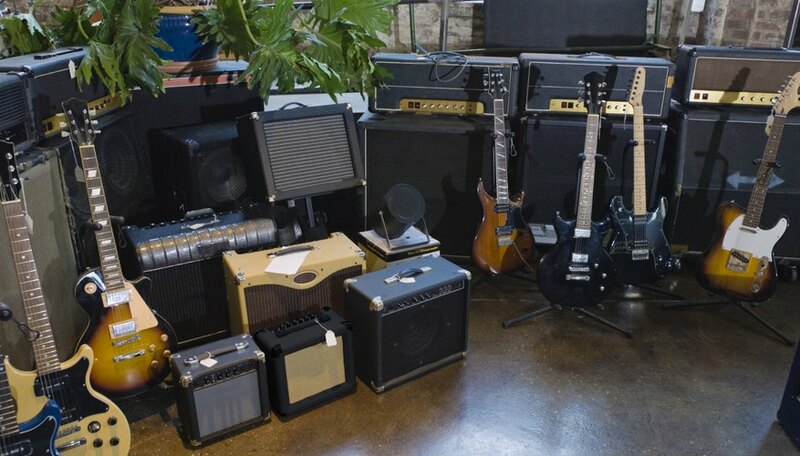 A ragged grill cloth can bring down the appearance of an otherwise spectacular guitar amp. Fortunately, it's usually pretty easy to replace the old cloth and put a new one on with only some simple hand tools--an easy and refreshing upgrade for your amp's appearance. Remove the speakers, if necessary. Depending on the exact amp model you have, you might have to disconnect and remove the speakers to access the frame that holds the grill cloth. Use some Scotch tape to temporarily fasten the loose screws near where they go for easy reassembly later. Remove the grill cloth frame. The frame is usually a wooden square with the cloth stretched across it, similar to the way canvas is stretched on a frame for painting. The frame itself is typically attached to the main amplifier cabinet with a few small screws and brackets. Again, it may be helpful to tape them in place to help remember where they go. Remove the old grill cloth. The exact way it's attached to the frame will vary depending on what kind of amp you have, but it will typically be stapled to the frame. Depending on your cabinet configuration, you may be able to cut it off the frame without showing any of the old fringes, or you may have to pull the staples out. Stretch the new grill cloth and attach it to the frame. Make sure the cloth is stretched evenly and tautly all the way around, so that no wrinkles appear later. It may be helpful to use clamps to hold it in place around the frame as you stretch it. Once it's stretched and you've checked that there are no wrinkles, attach it to the frame with staples or small nails. Reassemble the amplifier. Do this in reverse order from the way you disassembled it. On a typical amplifier, this means you will reattach the grill cloth frame to the cabinet first, then reattach the speakers. Bubbles or wrinkles are easy to introduce when stretching the frame and will detract from the amp's appearance later. Make sure the grill cloth is evenly stretched and taut all the way around before attaching it. The details of amplifier construction vary from model to model. This is a general overview of the procedure for a typical amp. You will have to adjust the procedure according to the idiosyncrasies of your particular amp model. Consult a qualified repair technician if you're unsure of what to do.